Tentative Agreement overwhelmingly passed between the IAM and Flagship Facility Services, Inc. 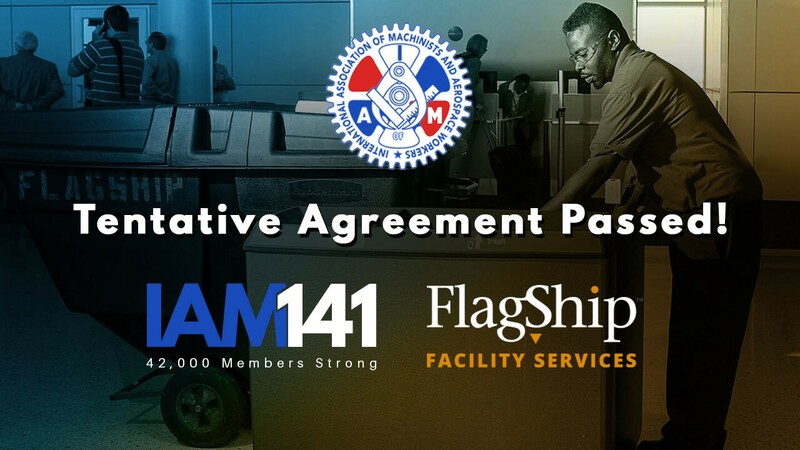 The Tentative Agreement between the IAM and Flagship Facility Services, Inc. was overwhelmingly passed by IAM members with 90% of votes in favor. With the new TA in place members will see wage increases, enhanced benefits, and pension contributions from Flagship. The agreement calls for a 14.1% increase in base wages, with hourly pay for Leads and Forklift Operators rising to $18.25 on the day of signing, an increase of over $3.00 per hour from current rates. Flagship will begin making contributions to the IAM National Pension Fund for every employee at the rate of .25 per hour worked up to 40 hours per week, with annual increases through the life of the contract, which expires on December 31, 2020. The agreement requires the company to conduct a minimum of one annual shift bid and makes the awarding of overtime a more transparent process. In addition, any employee held out of service for any reason will have full pay restored after the 30th day. Employees will have an additional paid holiday for their birthday and increased sick bank and funeral leave.